This most recent revision to the 126 Theremin design specifies Murata part number SFULA455KU2A-B0 for the ceramic filter, schematic item X1. SFULA455KU2A-B0 is available from Harrison Instruments as item number 99999-5915-126X1. Toko part number ##AHCFM2-455DL, originally specified, will also function in the revised schematic, but is no longer available. from ebay as item 201981928615. Builders within the United States should order these items from Harrison Instruments. The information contained in this document is ©2002, 2003, 2005, 2014, 2015 by Arthur Harrison. Any reproduction of the information contained in this document, electronic or mechanical, shall only be used with Arthur Harrison's permission, and shall acknowledge him as the copyright holder and author. Use of the information contained in this document for personal or commercial financial gain, such as the manufacture and sale of electronic musical instruments or parts thereof, is prohibited. Unless specifically stated in a written contract, Arthur Harrison grants no license for the commercial exploitation of the concepts and designs embodied in this document. Refer licensing inquiries to: diy@harrisoninstruments.com. The circuit described in this article uses AC mains voltage and other high voltages that can cause injury or death. It is the responsibility of the user of this circuit to be familiar with all applicable safety practices regarding its construction, testing, and use. Some parts used in this circuit only function properly when inserted in the right direction. Always verify the orientation of polarized capacitors, diodes, rectifiers, transformers and vacuum tubes before applying power to them. Do not use a part that has been subjected to improper insertion. The vacuum tubes in this circuit become hot and can cause burns. Wear safety glasses and use all appropriate safety equipment when working with tools and materials. Always follow safe shop practices and obey safety rules. Do not play this instrument at a high volume, especially when using headphones. Use headphones that have a built-in volume control, and adjust the volume for a comfortable level. Hearing experts advise against the continuous, extended use of headphones. This circuit is recommended for users familiar with electronic theory and construction practices. It is recommended that suitable test equipment, including a frequency counter and oscilloscope, are available for making measurements. I express my sincere thanks to John Speulstra and Rick Hansen for their assistance in refreshing my knowledge of vacuum-tube techniques, and also to Steven Hasten for providing me with the incentive to pursue this design, and his construction efforts in verifying its performance. I also express my sincere thanks to Roger Kaul for assisting in the Vacuum Tube LTSPICE simulation analysis for the revision-3 volume control circuit design. This is my second vacuum-tube theremin design, which is an expansion of its predecessor, the pitch-only 125 theremin. The 126 theremin has both pitch and volume features, as well as a tone control. As in the 125 theremin, I have designed the 126 entirely with the popular 12AU7 vacuum tube. The pitch section consists of the classical two-oscillator heterodyne configuration, and the volume section employs a slope-detection method, with a ceramic filter. The ceramic filter provides the high selectivity required for the small frequency changes induced by hand capacitance, replacing the elaborate and costly inductor-type circuits usually used for this purpose. As with the 125 theremin, exceptional frequency stability for temperature variation is achieved, both in the pitch and volume sections. The 126 theremin may be heard by clicking on the mp3-file link below. The sample was recorded with the tone control in the fully-counterclockwise position. The volume circuit is shown on schematic page 1, below. This is REV. 2, replacing the obsolete Toko part (X1) in previous revsisons with a Murata part. Murata announced the obsolescence of this part in December 2014. However, there is still stock available at Harrison Instruments. Note that the obsolete Toko types specified in the older revisions (REV. 0 and REV. 1) will also function in the REV 2 schematic. 1) The X1 filter type has been respecified as Murata type SFULA455KU2A-R0. 4) V1B has been reconfigured to provide voltage gain by the addition of 18,000 ohm cathode resistor R29. 5) Capacitor C9's connection to V1B's cathode (pin 8) has been reconnected to V1B's plate (pin 6). As with most of the author's designs, the volume for the 126 Theremin increases as the hand approaches the volume antenna. While this is contrary to a majority of theremin designs, the "closer for louder" methodology improves the instrument's playability. Another version of the volume circuit, (REV. 3, 1-1-2015), provides the added feature of a selector switch that enables the volume to either increase or decrease as the hand approaches the volume antenna. This design was provided for builders who are accustomed to the older, more traditional method for volume control. However, other than the supplemental inclusion of the REV. 3 schematic, the documentation in this article (Circuit Description, Component Locations drawing, Test Voltage Table, and Parts Table) correlates with the configuration shown in volume circuit REV. 2. Vacuum tube V1A and its associated components form a Colpitts oscillator that includes hand capacitance, via antenna A1, as a frequency determinant. 455kHz ceramic filter X1, driven by the oscillator via C7, performs the function of a frequency-slope detector. With the hand away from the antenna, the oscillator frequency is at resonance with X1, and the greatest amplitude sine wave is present at X1's output. As the hand approaches the antenna, the oscillator diminishes in frequency, resulting in a diminished amplitude at X1's output. Note that the center frequency of the ceramic filter is 455kHz when used in a radio receiver with a specific intermediate-frequency transformer. However, in this application, the filter is less "loaded," and will exhibit a center frequency of about 458.5kHz. The use of such a filter is particularly efficient in the 126 Theremin design, since it offers a very low components-count approach to implementing the volume circuit without resorting to an active isolation stage following the volume oscillator, as would usually be the case if the filter was the common L-C design. V1B amplifies the amplitude of the sine wave at X1's output, as well as providing impedance matching between X1 and the subsequent circuit. The output of V1B is AC-coupled through C9 to V2A, a diode-connected triode used as a DC restorer. V2A establishes the top of the voltage waveform at essentially zero volts. As a result, the volume hand's proximity controls the negative-peak amplitude of a sine wave present at the grid and plate of V2A. As the hand nears the antenna, the amplitude of the sine wave diminishes, moving its negative peak toward zero volts. V2B is a diode-connected triode which, in conjunction with C10 and R7, provides a DC level corresponding to the peak value of the sine wave. This DC level is applied to the grid of V3A via R8, which, with V3B, constitutes a differential amplifier. The audio signal from the pitch section (point "A" in the schematic) is also applied to the grid of V3A via coupling capacitor C11. As the DC grid voltage at V3A varies from the peak negative value to nearly zero, the tube is driven from cut-off to conduction. The amplitude of the audio waveform is varied accordingly at V3B's cathode, and reflected in V3B's plate, which provides the theremin's output. The DC volume control bias is removed from the output by capacitor C13. This most recent version of this circuit (REV. 2) exhibits at least 30dB of dynamic range, which is appreciably better than the 18dB achieved in the REV. 1 version. The volume response curvature and dynamic range may vary with the particular tube used in the V3 position. Several tube brands, including "new-old stock" Amperex, Phillips, and RCA; and new Tesla brands were evaluated, all with sufficient performance. The pitch circuit is shown on schematic page 2, below. V4 and associated components form a Colpitts oscillator that includes hand capacitance, via antenna A2, as a frequency determinant. Another oscillator, comprised of V6 and associated components, is the reference oscillator. The oscillators employ cathode-follower sections, V4A and V6A, to buffer their resonant networks from loading effects and to provide low impedance outputs. V5B is used as a mixer, with the pitch variable oscillator signal applied to its grid via capacitor C19 and the pitch reference oscillator signal applied to its cathode via resistor R21. With tone-control potentiometer RV1 in the extreme counterclockwise position, the reference oscillator output is coupled to the mixer via C28. Electrical coupling between the two oscillators occurs because the signal at V5B's cathode includes the signal present at it's grid. This signal, from the variable oscillator, is reflected back into the reference oscillator, via V6A's cathode. Under this condition, the maximum amount of oscillator coupling produces the greatest amount of harmonic content in the audio waveform. With RV1 in the extreme clockwise position, the reference oscillator's output is isolated from the mixer via V5A. In this condition, the mixer's cathode signal has less influence on the reference oscillator, because it is attenuated by RV1's 50k ohm resistance. As a result, the harmonic content of the audio waveform is comparatively reduced. The heterodyne of the two oscillator frequencies is present at V5B's plate. Two sections of low-pass filtering reduce the sum frequency product; C21 in conjunction with V5B's plate-circuit resistance, and R22 with C22. For the volume oscillator, L is 1mH, Ca is 330pF, Cb is 100pF, and Cc is the sum of C5, C6, and the A1 antenna capacitance. C5 is adjusted so that the volume oscillator's frequency is equal to X1's resonant frequency of 455kHz with the hand away from antenna A1. For the pitch oscillators, L is 1mH, Ca is 1000pF, Cb is 330pF, and Cc is the A2 antenna capacitance (for the variable oscillator) or the value of the C24 pitch-zeroing capacitor (for the reference oscillator). Each of the pitch oscillator frequencies are typically 310kHz. As in any heterodyne theremin, an essential requirement is that the two pitch oscillators are very close in frequency, so that an audible tone can be produced. Optimally, the theremin should provide a "zero-beat" condition with C24 set to its mid-capacitance point, with the hand away from the pitch antenna. A low frequency audible output should result when the hand is brought within 12 to 24 inches of the pitch antenna, increasing in frequency as the hand becomes closer. To reduce the pitch variable oscillator's frequency, add a small mica capacitor with a value between 2 and 30pF in parallel with its coil (L2). To increase the pitch variable oscillator's frequency, replace 330pF capacitor (C17) with a 300pF mica unit, and then, if necessary, add a small mica capacitor (with a value between 2 and 15pF) in parallel with the 300pF unit to "trim" the frequency back downward. Move L2 toward or away from the theremin mounting plate; toward the plate for decreasing frequency, and away from the plate for increasing frequency. To reduce the volume oscillator's frequency, add a small mica capacitor with a value between 2 and 10pF in parallel with its C6. To increase the volume oscillator's frequency, reduce the value of C6, or remove it. Move L1 toward or away from the theremin mounting plate; toward the plate for decreasing frequency, and away from the plate for increasing frequency. To eliminate the necessity for extensive trimming, the capacitors associated with the three oscillator frequency-determining networks (C2, C3, C6; C16, C17; C25, C26) should have ±5% or better tolerances. To ensure good frequency stability, these capacitors should be mica types, and the three oscillator coils, L1, L2, and L3 should be the J.W. Miller 4652 phenolic-core types specified. Capricious substitution of the coils may adversely affect or inhibit the theremin's operation. Also for frequency stability, C5 and C24 should be air-variable types. Too much capacitance change per degree of shaft rotation will degrade adjustment resolution. Therefore, the maximum value of 27pF is recommended. Variable capacitors with a planetary reduction vernier will further enhance resolution. Such capacitors, with 3.85 turns of shaft rotation, are indicated in the schematic, and highly recommended. The overall frequency of the theremin's operation may be changed with the substitution of frequency-determining components. However, the values indicated, providing approximately 310kHz in the pitch circuit and 455kHz in the volume circuit, were selected to prevent AM radio-band interference, while maintaining adequate hand-sensing distances. The tone control's position has a slight effect on the pitch reference oscillator's frequency. Therefore, changing the tone will require a minor readjustment to pitch zero capacitor C24 for resetting the zero beat. However, this readjustment can be achieved very rapidly and conveniently. The power supply is shown on schematic page 3, below. Voltage regulation is not employed in this circuit, since the oscillators exhibit excellent frequency stability with considerable supply variations. The total current drawn from the 50 volt supply is approximately 4mA. Heater transformer T2 is rated to provide 10 volts RMS for a 1.2A load. The six tubes use approximately 900mA of heater current, so T1's actual loaded output is about 11.5 volts RMS, which is adequate for the 12.6 volt-rated 12AU7s or ECC82s. The theremin's parameters stabilize after a brief warm-up period of about three minutes. Thermal coefficients in the circuits have negligible contribution to long-term drift, with parameter readjustment only required due to shifts in the player's stance, or pitch readjustment, if the tone setting is altered. Some builders may wish to use alternative transformers to match their available mains voltage. If different transformers are used, measure the supply's output voltages while the theremin is connected, to ensure that the heater voltage is between 11.5 and 12.6 volts RMS AC, and that the B+ voltage is between 45 and 50 volts, DC. To reduce the risk of injury, I designed this theremin with a maximum supply of approximately 50 volts, DC, which is considerably less than voltages used in many other vacuum-tube instruments. However, values substantially less than 50 volts can still be dangerous for conditions in which sufficient current is caused to flow through the body. Therefore, 330pF ceramic capacitors C4 and C15 provide a safety function by preventing the presence of +50 volts on the antennas. Do not omit capacitors C4 or C15 from the circuit. Reference: PAGE 1 REV. 3. This is an alternative design for the volume control circuit, allowing either "closer for louder" or "closer for softer" response. This implementation reverses the polarity of the V2A and V2B diode-connected triodes, adds resistors R30 and R31, increases the value of C12 from 10uF to 100uF, and adds a switch to select the type of volume response. Please note that the documentation in this article (Circuit Description, Component Locations drawing, Test Voltage Table, and Parts Table) only applies to the configuration shown in volume circuit PAGE 1 REV. 2, but not PAGE 1 REV. 3. 1) Per availability, X1 filter changed from Toko part number ##AHCFM2-455DL to Murata type SFULA455KU2A-R0. 2) R5 changed in value from 150,000 ohms to 1M ohms. 3) R6 changed in value from 5,600 ohms to 2,000 ohms. 1) Per availability, X1 filter changed from Toko part number AHCFM2-455CL (8kHz bandwidth, containing lead) to Toko part number ##AHCFM2-455DL (10kHz bandwidth, with RoHS approval). 2) R3 changed from 1M ohm to 390,000 ohms. This change improves the volume dynamic range by allowing the lowest volume to come closer to zero. View Schematic PAGE 1 REV. 0 here. View Schematic PAGE 1 REV. 1 here. Revision 3 of the above schematic is available HERE. The 126 theremin, illustrated below, is constructed on a 8" x 12" x 1/16"-thick aluminum Theremin Mounting Plate. The theremin mounting plate is attached to a 11" x 17" x 1/2"-thick plywood Base with four threaded standoffs. The volume and pitch Antennas are 8" x 5 1/2" x 1/16"-thick aluminum plates that extend from the left and right edges of the base, respectively. The antennas are separated from the base with 1/2"-long threaded nylon standoffs to reduce their mutual capacitance, and connected to the circuit with 16 gauge solid bus wire. The wires are connected to the antennas with number-6 solder lugs, secured by one of the mounting screws at each antenna. The bottom of the base (not shown in the illustration) is equipped with an Atlas Sound type AD-11B threaded microphone stand adapter. 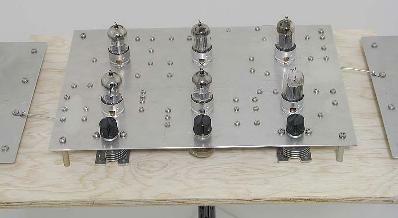 The theremin's components, including two connectors and their brackets, are mounted on the bottom of the theremin mounting plate, with the tube envelopes and the control shafts for C5, C24, and RV1 on the top. The six 3/4" holes for the tube sockets and two 5/8" holes for the variable capacitors can be made with suitable chassis punches (Greenlee types 730BB-3/4 and 730BB-5/8). Refer to the Component Locations drawing. Screw-mounted Insulated Solder Turret Terminals provide junction points. Where required, component leads are insulated with 16 gauge Teflon® sleeving. Point-to point wiring is used, with 22 gauge, 19-strand Teflon®-insulated hookup wire, and 20 gauge solid tinned-copper bus wire, as required. Regarding insulated hookup wire, the parts tables specify a variety of colors based upon wire function. Although color differentiation is good practice and recommended for electronic construction, the builder may elect to economize by using only one color. Note that black wire is specified for the transformer primary line connections, and also for the DC return connections. To prevent shock hazards, do not confuse the dual functions of black wires. Wires are anchored to the theremin mounting plate, as required, with adhesive-backed mounts and nylon cable ties. Leave a little slack in the leads of the three coils so that they can be moved with relation to the plate. This technique permits small variations in capacitance that may be used to fine-adjust oscillator frequencies. Keep frequency-determining components C2, C3, C6, C16, C17, C25, C26, L1, L2, and L3 clear of other parts and wires. To prevent audible hum from the heater circuit, twist the heater wires tightly together and route them in a direct manner away from signal paths. Ceramic filter X1 has relatively delicate, closely-spaced leads, nominally intended for printed-circuit board installation. To adapt X1, it is recommended that its center lead be soldered directly to the top of its respective turret terminal, and that short pieces of 20 gauge bus wire are soldered to the outside leads at right angles, and extended to the tops of their turret terminals. While assembling components onto the theremin mounting plate, temporarily attach four pair of long standoffs to the corner holes to protect the components from being damaged by the work surface: Four standard 2 1/2" types on the top side of the plate, and four 2" male/female types on the bottom. Each male/female standoff has a stud inserted through its hole to engage a standard spacer. Once all the parts have been assembled onto the plate, the temporary standoffs may be removed, and replaced with four 1 1/4"-long standoffs which are used to attach the plate to the wood base. Ground wiring may be "daisy-chained" in any convenient manner. Run a wire from each chain, as well as terminal 1 of power connector J1, to a single point on the metal chassis. The J2 output jack is a fully insulated type, to prevent audible hum from ground loop currents. Its sleeve terminal connects to the single-point ground, as well. Variable capacitors C5 and C24 have their "rotor" terminals connected to their frames, and therefore become electrically grounded by their mechanical attachments to the mounting plate. Each variable capacitor has four solder lugs that are redundant "stator" terminals. On each capacitor, only one of these terminals is connected to V1A's and V6B's plate, respectively. For safety, power supply components J3, F1, SW1, T1, T2, BR1, C30, C31, and R28 are fully enclosed in a 5" x 6" x 4" aluminum utility cabinet, separate from the main assembly. J4 is an AC power inlet that mates with a 3-wire, grounded cord identical to the type used for most computers and test equipment. For construction simplicity, all the power supply parts are mounted to the inside surface of the utility cabinet's top panel, as illustrated in the Power Supply Lay-out drawing. Specific dimensions for the top panel are shown in the Power Supply Mounting Plate Hole Locations drawing. Note that the top panel is fabricated from 0.062"-thick aluminum, which replaces one of the two thinner, 0.040"-thick panels provided with the cabinet. Adhesive-backed mounts and nylon cable ties are used to secure wires as required. The AC power inlet, fuse holder, switch, and transformer terminals are insulated with 1/8", 1/4, or 1/2"-diameter heat-shrink tubing, as required. Use the 1/2"-diameter tubing as an overall insulator for the rear of the fuse holder. Four self-adhesive feet are applied to the cabinet's bottom panel. A four-wire extension cable with 9-pin "D" subminiature connectors connect the theremin assembly and power supply together. The length of the extension is optional, with about four feet being typical for extending from the floor to the top of a stand. Refer power supply construction to a qualified electrician. Build the power supply in a separate, fully-enclosed cabinet. Do not defeat the grounding provisions shown in the schematics. The following voltages are from the 126 theremin breadboard, measured with a Tektronix type 485 oscilloscope, and a 10Mohm, 10X-attenuation probe. Unless otherwise noted, A1 and A2 are substituted with 10pF mica capacitors connected from C4 and C15 to ground, respectively. RV1 is adjusted fully clockwise. V4 or V6 are removed for some steps to simplify measurements. Values may vary ±20% due to component tolerances and variations in test conditions. The values in this table reflect the December 15, 2014 design revision. Please note that the documentation in this article (Circuit Description, Component Locations drawing, Test Voltage Table, and Parts Table) only applies to the configuration shown in volume circuit PAGE 1 REV. 2, but not PAGE 1 REV. 3. Adjust C5 for peak amplitude. Frequency determined by C24 adjustment. Remove V6 for this test. Remove V4 for this test. Value measured at the output jack with RV1 centered, and the pitch set for approximately 650Hz. V5B plate V5-6 - Audio wave with 100mV RF modulation. Audio frequency determined by C24 adjustment. These are two photos of the 126 Theremin prototype, courtesy of Jack Hurwitz. Johannes Graenzer of Bayreuth, Germany constructed this 126 Theremin with monopole antennas for his university project. He reports that the instrument worked "immediately... and sounds nearly as good as C. Rockmore's if you play it by making a little vibrato..."
David Hunter of Toronto, Canada, built this 126 Theremin. The power supply is in the base, along with a speaker and amplifier. Christopher Billey submitted this picture of his 126 Theremin. His version uses traditional antennas. It is his first vacuum tube theremin, and he reports that he is "very pleased with pitch range and sound quality." Brendan Pope, an 18 year-old student from North Carolina, built this version of the 126 Theremin for his school project. It is the first theremin he has ever owned or built. Brendon relates "Its sound is supreme to any other homemade theremin I've heard." Tomislav Ribicic of Croatia built this beautiful version of the 126 Theremin. The custom shellacked and waxed wood cabinet is topped by a stainless steel chassis plate. Traditional rod and loop antennas were used. Tomisalv reports that the theremin "sounds fabulous." He plans to install the instrument in the Caffe Jazz Tunel in Rijeka. Yaroslav Sadovskiy of Moscow, Russia built this amazing version of the 126 Theremin. The six vacuum tubes are illuminated by LEDs, and the legends, laser cut into stainless steel plate, are likewise illuminated. Yaroslav reports good pitch sensing distance with the telescoping antenna, which also serves to fine-tune the theremin's zero in lieu of vernier capacitors. The wood sides add a "touch of vintageness," per Yaroslav, who also reports that the 126 "has the pure, classic theremin sound." The author is very pleased to have this wonderful 126 created in the city where Leon Theremin worked for a decade at the Moscow Conservatory of Music. Eric Reiswig from Canada built this excellent 126 Theremin with traditional loop and rod antennas fabricated from 3/8-inch diameter brass tubing. He incorporated the use of an IC reversing circuit to permit optional "closer-for-softer" volume response, and has expressed great satisfaction with the instrument's sound qualities. Eric's work is documented on his theremin webpage. Jeremy Merrill constructed this beautiful 126 Theremin in a wormy chestnut cabinet with a stainless steel chassis inset. 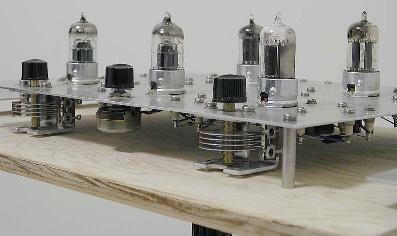 He reports that the tone is excellent, and that his success has inspired him to build additional vacuum tube projects. The antennas are copper tubing, and the stand was adapted from a lamp. This wonderful rendition of the 126 is named The Spheremin by its creator, Francesco Zuddas of Monfalcone, Italy. Francesco relates that two of his friends, both violinists, played the instrument, and found it to be amazing. Francesco used DC switching power supplies of 12 and 48VDC to power his design, with excellent results. James Means produced this fine 126 Theremin and reports that it sounds "great through his Fender Twin Reverb amp." The enclosure is reclaimed wood from furniture drawers. Guy Pasquet from the town of Joigny in the Burgandy region of France built this accurate version of the 126 Theremin. Guy is a veteran of electronics, born in 1927. Suppliers indicated are not necessarily exclusive sources. Table 7 indicates temporary items used to aid construction. † = item appears on more than one line. NOTE 1: One each, McMaster-Carr stock number 89015K37, provides enough material for both antennas. NOTE 2: Obtain material locally, fabricate per drawing. Triad Magnetics: http://www.triadmagnetics.com/home.htm. Refer to their "Quick Pack" (TM) product line. Magnetic Coils, Inc.: http://www.mcitransformer.com/. Refer to their "Quick Connect Power Transformers" product line. Hammond Manufacturing: http://www.hammondmfg.com/. Refer to their "186/187" product line.